The green dotted line shows where the Federal Rails Administration (FRA) proposes a railroad line of the future should be. 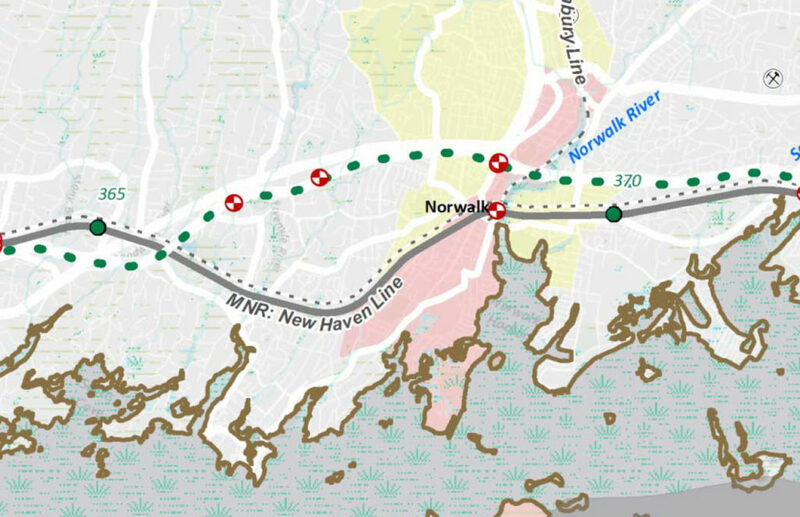 NORWALK, Conn. – It’s understandable that people are upset about a Federal Rails Administration (FRA) proposal to run a new railroad track through Norwalk, Darien and Westport but concerns are premature, State Senate Majority Leader Bob Duff (D-25) said Saturday. “I am not sure there’s any there, there,” Duff said Saturday, responding to a question from Diane Cece about the Federal Rails Administration (FRA) advertised Preferred Alternative to the Northeast Corridor (NEC) rail line, which surprised Norwalk with a nebulous plan for an alternative track through the city. No one has been provided with the details of the plan, not even legislators, Cece said at Saturday’s League of Women Voters “Pie and Politics” event at the Norwalk Police station. “I won’t argue with that,” said State Rep. Chris Perone (D-137), informally dubbed state “transportation czar” and more formally named chair of the Appropriations Committee’s Transportation subcommittee and chair of the Finance, Revenue & Bonding Committee’s subcommittee on Transportation Bonding. The federal delegation objected to FRA’s Preferred Alternative when it came out in December, and “both scenarios,” either “tunneling under or running along 95,” would be terrible disruption to Norwalk, which is already expected to make a big sacrifice for the rebuilding of the Walk Bridge, he said. “The high speed rail would be 10-year project at minimum,” he said. “They keep saying ‘Don’t worry, this is going more slowly than you think,’ but it is true that this was drafted without consultation with the local communities and that is never a good thing,” State Rep. Gail Lavielle (R-143) said, after explaining that Westport has a grant to do a Transit Oriented Development (TOD) study for Old Saugatuck, which would be decimated by the plan. Gov. Dannel Malloy recently urged FRA to table consideration of any new alignment of tracks on the Northeast Corridor through Connecticut and instead focus its “long overdue” investments on maintaining the corridor in a “state of good repair,” according to a press release. I was surprised to learn that State Senator Duff had not read the Tier 1 document, which I referred him to following the LWV event. The maps in there are preliminary, but do identify high-speed rail tracks coming through Connecticut, and indeed through his districts in Darien and Norwalk. Even the drawing above in this story outline the rails along I95. I wonder how many public meetings he attended over the past several years to learn about and keep on top of this project?